Contentious from the very outset, with a level of opposition that I have not witnessed in Swale since the days of thousands of people protesting against the Kent Science Park plans, plans which incidentally are back on the table and promoted by the very same developer Quinn Estates. 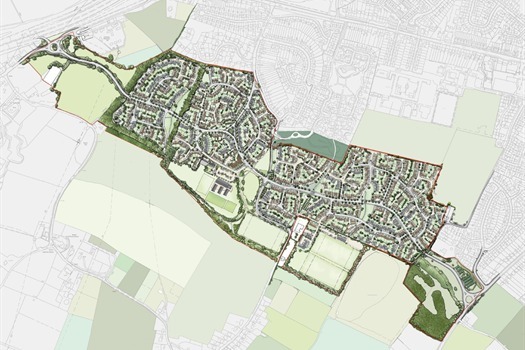 However regardless of whether you opposed or supported the scheme, or even if you remain ambivalent, the ramifications of this decision will have far reaching implications for Swale and especially the residents of Sittingbourne. Last Wednesday evening the planning committee met to consider the Wises Lane scheme for 675 houses in Borden promoted by Quinn Estates, so who better than Mark Quinn himself to provide a synopsis of the proposals. You know it’s going to be an interesting night when the meeting commences with a statement from Cllr James Hunt explaining that he has taken legal advice following remarks on Facebook that allege Mr Hunt had let slip that he is a personal friend of the developer Mark Quinn, a claim I might add that Mr Hunt vigorously denies. However, the gushing endorsement of the proposals and sycophantic praise of the planning department that followed will not have helped in alleviating any doubts that residents may still harbour. It hasn’t been a smooth ride for the planning department, with new evidence materialising literally hours before the meeting through to consultations that remain in progress even though the decision has now been made. The vast majority of the meeting comprised of discussions about the shortcomings of the proposals rather than from those voicing support. This application does not conform to the local plan but was however recommended on the basis that the proposed transport benefits outweigh its many shortcomings. This, in itself, isn’t unusual in that many applications require a careful and considered balance between meeting the objectives of plan policies and the overriding need to provide sufficient housing. However, what singles out this application from others is that it challenges one of the most fundamental aspects of the councils Local Plan, the housing land allocation. This is the primary means of both protecting the council from unwanted development and building in a controlled, planned and sustainable way. With nearly a third of the land area outside of the boundaries of the Local Plan allocation, the Council has inevitably left itself wide open to legal challenges from other developers.It also allows for the development of an important countryside gap and part of Borden Nature Reserve as well as failing to provide the agreed level of affordable housing by some considerable margin. I am sure you are keen to learn exactly what we can look forward to in terms of road improvements that benefit Sittingbourne. The primary selling point of the entire scheme is the provision of a completely new road running in a parallel fashion with the A2 from Borden Lane through to the A249. A road we are told that will remove traffic from both the A2 and Key Street Roundabout. Sounds good right, well it comes with a few little surprises that might make you think again. Firstly, in order that traffic is removed from the A2 it will have to make its way to this road, and that for me is where the whole strategic nature of the proposals falls by the wayside. The A2 / Borden Lane junction is certainly not capable of handling that kind of modal shift in traffic patterns, so what alternatives are left, Homewood Avenue perhaps or maybe any of the other small connecting roads? Sure, this scheme will almost certainly and irrevocably change traffic patterns in central Sittingbourne but I’m far from convinced that it will be for the better. In my opinion, this is likely to result removing traffic off the A2 far earlier than, I presume, is anticipated. I would envisage that any road connecting with Homewood Avenue is going to see significant increases in traffic. I would be genuinely concerned if I lived in Burley Road, Road Rock, Ufton Lane, College Road, Minterne Avenue or Riddles Road. However fear not because we are informed that there are plans for roundabouts, lots of roundabouts on Borden Lane, although we’re not entirely sure exactly where they might be located. From what I’ve gathered, because Swale Borough Council are not inclined to offer any explanation, there will be a new roundabout at the junction of the new spine road and Borden Lane and then possibly two mini roundabouts between the staggered junctions of Adelaide Drive and Homewood Avenue. To help improve traffic flows on the A2 they are going to add a new 3-way set of traffics lights at the Wises Lane junction. 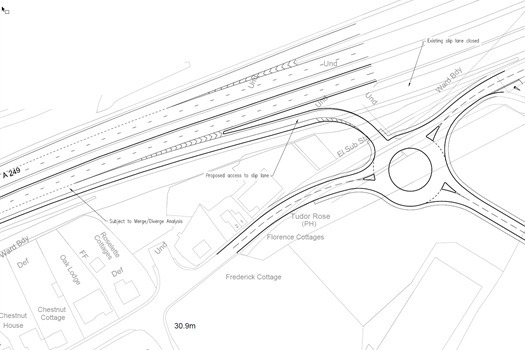 Key Street roundabout will also have some new traffic lights and the existing slip road on to the A249 will be closed. Instead you will have to drive down Chestnut Street and join another roundabout at the intersection with the new road and then join the A249. Obviously, there are no benefits for traffic coming into Sittingbourne as that will all still require the use of Key Street Roundabout with its new traffic lights to help speed everything along. I should also add that it will take another 3 or 4 years from when the site commences for the new road to join with the A249 it won’t be fully open for at least another 7 or 8 years based on the councils predicted forecasts, so any perceived transport benefits are a long way off yet. Unfortunately, it would appear as though claimed transport infrastructure benefits not only trump everything else in terms of priority, but often come at the expense of education, health and social wellbeing and it is not hard to see why. New and improved infrastructure leads to more development opportunities by opening up yet more land up for development. We simply cannot carry on like this, councillors need to wake up and actually start taking some responsibility for their actions. It is no longer sufficient to point the finger elsewhere, and particularly as is so often the case, when those very same councillors are also part of the organisations with which they levy the blame. The long-term problems being created right here and now are abundantly obvious, and quite frankly it is no wonder that Swale ranks so poorly in so many areas. Cllr Bonney made a rather pertinent comparisons between this scheme and one in Bapchild, called Stones Farm. Both are similar in terms of the number of houses being provided, this scheme proposes 675 dwellings and Stones Farm is I believe around 650. Both are reasonably large schemes expected to commence within the year. Yet neither of these schemes are providing any new medical facilities within their respective developments. The size of both of these applications require developer contributions towards a new primary school. Stones Farm is utterly reliant on Lansdowne Primary School to fulfil its needs, which I would be very surprised if it is capable of delivering. This application allocates land and provides a sum of money towards to building of the shell of a new school. I really can’t stress this enough, but this does not guarantee that a new school will actually be delivered. KCC still have to find the money to equip and staff the school. KCC have hardly built any new primary schools in Sittingbourne in the last few decades, and if there is no commitment forthcoming from KCC within 10 years of receiving the Section 106 contributions from the developer, the developer gets the money back and can pop a few additional houses into the space to boot. Ten years is not actually a very long time and probably shorter than the development period of the site. KCC have a really poor track record when it comes to anticipating educational growth projections and our KCC members including some who voted in favour of this scheme have failed to make adequate provision in Sittingbourne time and time again. The most shocking difference between these two developments is however the quantity of affordable housing proposed. Wise Lane offering a fraction under 12%, whilst Stones Farm is currently claiming to be able to deliver a whopping 70%. There is something fundamentally wrong here, it simply isn’t possible that these two extremes can co-exist concurrently together. I don’t know who signed off on the viability of either of these schemes, but should it prove possible that a 70% affordable housing ratio is deliverable then it would utterly demolish the viability assessments of dozens of other sites around Swale and the respective findings of the courts who have frequently ruled in favour of developers seeking to diminish their responsibilities on economic grounds. And just for the record, whilst Stones Farm might not have quite the same level of associated infrastructure costs as those of the Wise Lane proposal, it still requires significant amount of Section 106 contributions. Cllr Ghlin Whelan observed that the development was primarily 4 and 5 bedroom properties and questioned whether the council were putting viability above local housing need. Borden Parish Council commissioned an air quality report by Dr Ashley Mills and Professor Stephen Peckham from the University of Kent to provide an impartial air quality report whose findings disputed those of the developer and suggested that there were already significant issues in Borden. The council then took the unusual step of employing their own consultants whose findings supported the developer. I would imagine that the University of Kent will be none too pleased, as this infers that their work was not even lawful, so you might be surprised to then learn as we did from Cllr Angela Harrison that Swale Borough Council had also used the University of Kent on many previous occasions to conduct air quality assessments. So, should we now expect a slew of legal challenges in the face of this damning new evidence? The application was approved by nine conservative councillors voting in favour of the application, four of whom live in Faversham Andrew Bowles, Colin Prescott, Nigel Kay and George Bobbin, four from Sheppey Andy Booth, Tina Booth, Cameron Beart and Ken Ingleton and one from Iwade James Hunt. From a local plan point of view Sittingbourne is vastly under represented on the planning committee, and Faversham whose development footprint is tiny by comparison has more than double the number of councillors it should have, in my opinion. There were of course a number of Sittingbourne councillors who voted against the application including Monique Bonney, Ghlin Whelan, James Hall, Paul Fleming and Nicolas Hampshire all from Sittingbourne as well as Richard Darby and Angela Harrison from Sheppey. Base on planned growth and where all the planning applications are therefore likely to occur more than half the planning committee should by rights be made up of Sittingbourne councillors. Whilst many will argue that we need more housing for local residents, and especially affordable housing, it is questionable to what degree this application assists in delivering either of those objectives. Yes of course we need to build houses, but if that housing is neither affordable or meets local needs it isn’t the kind of housing that benefits anyone other than the developer. Due to the short comings of this project, the lack of any medical facility, schools, environmental impact, is there not a further route to oppose this. Is there not anyway the coucil be brought to task/opposed to by the residents of Sittingbourne due to their lack of a duty of care to the public, increasing ratio of patients to doctors, pollution, more traffic, no increase in number of schools. So, after spending £4.5m of taxpayers money on the current Local Plan, the council have completely ignored it and allowed development on an area that was not included. It does bode well for the replacement that the council is proposing (no doubt to accommodate Mr Quinn’s 10,000+ housing estate). Why bother at all - we were told that if there was no Local Plan then the planning inspector would rubber stamp planning permission for housing developments all over the countryside, yet here we have the council doing HM Planning Inspectorates dirty work for them. I wonder if they will let me knock up a pair of semis in my back garden? Excellent summary of the issues and of the travesty of democracy which took place last Wednesday evening. Worth adding too that, as the chairman himself pointed out at the start of the meeting, the Councillors on the committee were there to act in a quasi-judicial role, NOT as party political representatives, judging the application purely on its merits and in accordance with the law of the land. The fact that the Conservatives on the committee (including the chairman) then went on to completely ignore these strictures made the whole exercise a complete sham. The battle on Wednesday may have been lost, but the fight will go on. BRAD has identified so many faults in the Council's handling of the whole issue that this appalling decision by no means settles the issue. Such arrogant, self-serving disregard of the evidence, for the people of Sittingbourne and our green-belt is unrivalled. Councillors Bowels, Prescott, Kay, Bobbin, both Booths, Beart, Ingleton and Hunt have betrayed the voters of this Borough, brought shame on this town and on democracy within it . We will never vote Conservative again and have written to their Campaign Headquarters to explain precisely why. What can I say, this , as I see it is the start of more and more building on green field sites, something that the council cannot now refuse - voted in by most who do not even live in Sittingbourne and will suffer from the consequences of this decision. No matter what the Councillors say, I believe this was a done deal even before it was put out for consultation, which was in effect just a paperwork exercise to say that consultation took place. Kent will suffer, local residents will suffer, have even had the audacity to pass it even though it falls short of the requirement for social housing - this development is not for the benefit of Sittingbourne - it is for the benefit of those who will profit from the build - and I am pretty sure I know who a lot of them are. I just bet the Conservative Cllr's were sat there with a calculator working out roughly what 650 x Council Tax payments works out to every year !....and make no mistake, a 4 or 5 bed home in Sittingbourne is NEVER going to be an option for anyone hoping for an 'affordable' home, even with a percentage reduction in price we all know that would still be way out of an average families reach. Sadly this process is happening in other parts of Sittingbourne too, not just Borden, it seems pointless trying to fight against these projects as decisions are made no matter what us affected think about them. Devastating! So many people fighting for years for nothing! Someone from the council got a nice lump sum in their pockets for that. How disgusting! But only people to be blamed as they have chosen the council! I would check the size of the plot of land allocated to the new school - I have come across instances where the amount of land allocated is simply too small for a 'sustainable' school to be built on.